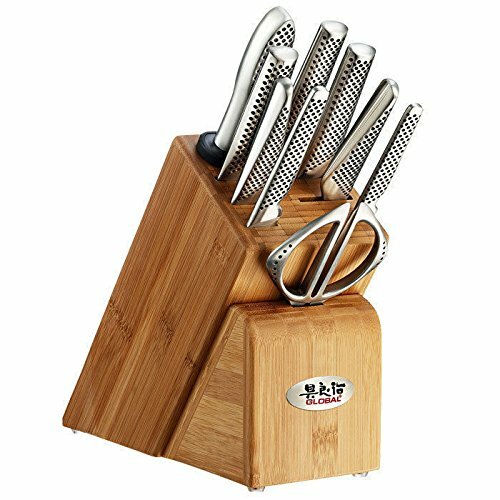 With the essential knives and tools to tackle any kitchen task, this sleek, modern knife set makes a versatile addition to any cook's collection. A common sight in commercial kitchens and designed to meet the exacting standards of professional chefs, Global knives pair handcrafted quality with cutting-edge materials and construction techniques. Each Global knife features a precisely balanced, lightweight design that reduces hand fatigue and ensures perfect control at the cutting board. . Set includes:3" peeler. 4" paring knife. 4.25" utility knife. 5.5" vegetable knife. 6.25" flexible boning knife. 8" chef's knife. 8.5" bread knife. 8.25" kitchen shears. Ceramic sharpener. Knife block (10.25" x 4.5" x 9") . FEATURES Forged from a single piece of stainless steel for incredible strength, durability and performance. Lightweight G18 CROMOVA steel takes and holds a lasting edge-even at the ultra-sharp 12.5A Degree angle used in Japanese cutlery. Sleek, ergonomic handles feature Global's signature dimple pattern for a secure grip, comfort and control. Seamless design is hygienic and easy to maintain. Global knives are perfectly balanced thanks to handles that are precisely calibrated to offset the weight of the blade. Manufacturer: Global. Material: Stainless steel, bamboo. Care: Hand wash only. Warranty: Lifetime warranty. Made in Japan.